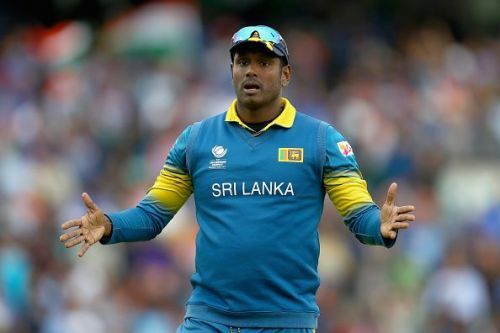 Sri Lankan all-rounder Angelo Mathews has hit out at his national board, Sri Lankan Cricket, for making him a scapegoat for his side's poor show in the ongoing Asia Cup 2018, where they were knocked out in the first round following huge defeats against Afghanistan and Bangladesh. Following this debacle, the Sri Lankan board sacked Mathews and handed over the captaincy to Dinesh Chandimal. Mathews, who was the captain of the side from 2013 to 2017, had initially stepped down from the post owing to Sri Lanka's poor run of form. in the meantime, the board handed over the captaincy to a number of players which included Upul Tharanga, Dinesh Chandimal, Chamara Kapugedera, Suranga Lakmal, Thisara Perera etc. But, their expectations of turning things around failed and they moved back to Mathews after the newly-appointed coach Chandika Hathurasingha had urged Mathews to take over the ODI captaincy again, keeping the 2019 World Cup in mind. After some dismal performances, of late, Mathews was asked to relinquish his captaincy duties again and it did not go well with the all-rounder. In a letter he wrote to the SLC CEO Ashley de Silva, he pointed out that he alone cannot be held responsible for Sri Lanka's poor performance. He also added that he is ready to call it a day if the selectors and the coach thinks that he is unfit to play ODIs and T20Is. "Though I was initially surprised, it was immediately felt that I have been made the scapegoat in this entire saga of Sri Lanka's dismal performances against Bangladesh and Afghanistan in the Asia Cup. "I'm willing to take part of the blame but at the same time, feel betrayed and let down if the blame is solely put on me. As you know all decisions are taken through a mutual understanding with the Selectors and the Head Coach. And though I do not agree with the reasoning that the losses should be accrued single handed to the captaincy, I however eagerly and wholeheartedly respect the request of the selection committee and the head coach in asking me to step down and do so with immediate effect," wrote in his resignation letter obtained by ESPNCricinfo. "You would recall that I relinquished my captaincy in all formats in July 2017, pursuant to captaining Sri Lanka continuously for a period of 5 years in all formats. During this tenure, under my captaincy, series wins were recorded against England, we whitewashed Australia 3-0 and winning the Asia Cup in 2014 were some memorable occasions. However in the team's best interest having felt that the time had come for new leadership I voluntarily resigned as Captain from all formats of the game in July 2017." "Thereafter, pursuant to Sri Lanka suffering heavy defeats in all formats and having several appointed Captains, namely Upul Tharanga, Thisara Perera, Chamara Kapugedara, Lasith Malinga and Dinesh Chandimal during the tenure between July 2017 and December 2017 in the ODI and T20 formats, Mr Chandika Hathurusinghe immediately having been appointed as Head coach met with me in person, requested me to reconsider taking up the Captaincy until the World Cup in 2019." "Though myself, my family and close friends discouraged me in taking up the mantle, being confident in Hathurusinghe and his plans to elevate the performances of the Sri Lankan team and in the best interest of my country I agreed to do so until the World Cup." "I also believe that if the selectors and coach are of the view that I am unfit to play ODI and T20 cricket and thus not entitled for my place in the team, I would also consider retiring from the ODI and T20 formats as I never want to be a burden to the team." With Chandimal appointed as the new captain, one can expect him to lead the team at least till the end of 2019 World Cup. But, given the history behind the last few captains, it won't be a surprise if Chandimal is sacked from captaincy ahead of the mega event.